With its relatively small genome and its ability to produce mutations that are analogous to those in humans, the humble zebrafish is already a valuable tool in genetics research. But it just got better: researchers at the University of Houston have developed a transgenic zebrafish that glows according to its biological clock. The fish, which incorporates a gene responsible for the flash of fireflies, should help scientists better understand the genetic basis of circadian rhythms, the metabolic processes linked to cycles of light and dark. Already, the Houston researchers have used it to study how the circadian clock is kick-started in the developing zebrafish. "What we've done is inserted a recombinant gene into the germ line of these fish," said Dr. Gregory M. Cahill, an associate professor and the co-author of a paper describing the work with Dr. Maki Kaneko in the open-access journal Public Library of Science Biology. In their work, the firefly gene is put under the control of a zebrafish gene that is a "biological clock promoter": it controls the expression of the firefly gene according to circadian rhythms. So the firefly gene produces more of an enzyme called luciferase during the morning than the evening. When zebrafish larvae are put in a special solution, the luciferase causes the larvae to luminesce. This glow, while faint, can be detected by a machine. When measured over time, it reflects the functioning of the fish's internal clock. With this approach, Dr. Cahill said, large numbers of larvae can be measured at once. "You want to identify mutants where the clock runs too fast or too slow," he said. 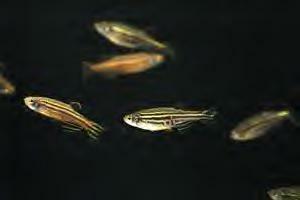 But mutations are rare, so a lot of zebrafish are needed. "In theory, you can test up to 2,000 animals at a time with this," he said. Once clock-affecting mutations are discovered, they can be compared with the human genome to better understand the genetic factors behind jet lag or other conditions that affect the body's rhythms. Similar comparative work is being done with fruit flies and mice. But Dr. Cahill said the new technique had some advantages. Unlike fruit flies (and like humans), zebrafish are vertebrates. And they reproduce much more abundantly than mice. "The nice thing about fish is that we can do lots of these, relatively inexpensively," he said. Professor Gregory M. Cahill’s research illuminates a ’first’ in this species Using genetically altered zebrafish that glow in the dark, University of Houston researchers have found new tools that shed light upon biological clock cycles. Gregory M. Cahill, associate professor of biology and biochemistry at UH, and Maki Kaneko, a fellow UH researcher who is now at the University of California-San Diego, presented their findings in a paper titled "Light-dependent Development of Circadian Gene Expression in Transgenic Zebrafish," appearing Feb. 1 in the Public Library of Science’s PLoS Biology, an online journal that, along with PLoS Medical, is committed to making scientific and medical literature a public resource. "By injecting the luc gene that makes fireflies glow into our zebrafish, our bottom-line finding goes back to nature versus nurture," Cahill said. "We found that these per3-luc zebrafish contain something in their genetic makeup that gets their clocks ticking without parental influence, however, we determined that it does take some sort of environmental input for the clock to start. In this case it was exposure to light/dark cycles after the fourth day of development, about the age when the fish start to swim and feed." The researchers used zebrafish (danio rerio) because they yield such a high output of spawn, with hundreds of eggs being laid by each female per week. This gives the scientists a better chance of identifying mutant fish whose biological clocks run fast or slow, providing the ability to trace the specific genes that create the anomaly. Putting UH a bit ahead of other institutions engaged in this type of research, Cahill and his team will be able to analyze more than 2,000 zebrafish per week. The per3-luc zebrafish is the first vertebrate system available for this level of high-throughput measurement. "Because we can test so many zebrafish at a time, the one in a thousand odds of finding a mutant are more easily and efficiently attainable," Cahill said. "Ultimately, this type of research can help with tracing why humans develop such things as sleep disorders or mental illnesses like depression." Per3 is the naturally occurring clock-regulated gene. The protein that it encodes is produced at highest levels near dawn, and when the luc gene is inserted into it, the luciferase protein is produced in a similar way. The result is that these fish glow rhythmically, emitting more light during the day than during the night. The amount of light is below the level of detection by the human eye, but it is easily measured with an instrument called a luminometer. "This has given us the tool we need to find other parts of systems that influence biological clocks," Cahill said. "We are optimistic that this will shed light upon such things as reproduction in other light-dependent animals." These findings have laid the groundwork for further study along these lines. With a team now built, UH graduate students who assisted with this project are now trained to work with Cahill to implement the next steps of this research. Prior to coming to UH in 1994, Cahill was a research assistant professor in the Department of Anatomy and Cell biology at the University of Kansas Medical Center in Kansas City and received his postdoctoral training at Emory University. He received his doctorate in biology and neuroscience from the University of Oregon in Eugene, where he studied the mechanisms of circadian responses to light. He graduated with his bachelor of science from the College of Biological Sciences at the University of Minnesota in Minneapolis/St. Paul. His research interests include molecular, cellular and physiological mechanisms of vertebrate circadian rhythmicity, photoreceptor cell and molecular biology, and neurobiology. He is a member of the Society for Research on Biological Rhythms and the Society for Neuroscience and is currently funded under a $1.2 million National Institutes of Health grant through 2007 as the principal investigator on "Genetic analysis of zebrafish circadian rhythmicity," under which this latest study falls. The roles of environmental stimuli in initiation and synchronization of circadian oscillation during development appear to vary among different rhythmic processes. In zebrafish, a variety of rhythms emerge in larvae only after exposure to light-dark (LD) cycles, whereas zebrafish period3 (per3) mRNA has been reported to be rhythmic from day 1 of development in constant conditions. We generated transgenic zebrafish in which expression of the firefly luciferase (luc) gene is driven by the zebrafish per3 promoter. Live larvae from these lines are rhythmically bioluminescent, providing the first vertebrate system for high-throughput measurement of circadian gene expression in vivo. Circadian rhythmicity in constant conditions was observed only after 5–6 d of development, and only if the fish were exposed to LD signals after day 4. Regardless of light exposure, a novel developmental profile was observed, with low expression during the first few days and a rapid increase when active swimming begins. 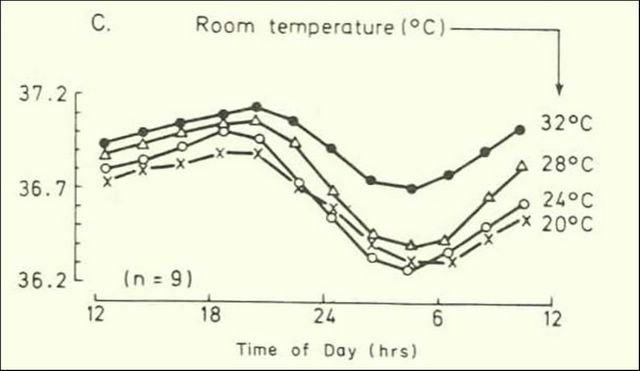 Ambient temperature affected the developmental profile and overall levels of per3 and luc mRNA, as well as the critical days in which LD cycles were needed for robust bioluminescence rhythms. In summary, per3-luc zebrafish has revealed complex interactions among developmental events, light, and temperature in the expression of a clock gene. Copyright: © 2005 Kaneko and Cahill. This is an open-access article distributed under the terms of the Creative Commons Attribution License, which permits unrestricted use, distribution, and reproduction in any medium, provided the original work is properly cited. "Fall back" will have an incredible impact for millions that are plagued by Seasonal Affective Disorder (SAD), commonly referred to as the "Winter Blues." Research in Ontario suggests that between 2 and 3 percent of the general population may have SAD. Another 15 percent have a less severe experience described as the "winter blues." Recent studies suggest that SAD is more common in northern countries, where the winter day is shorter and it is usually characterized by feelings of sadness, anxiety, and lethargy caused by the overproduction of melatonin, a sleep hormone produced by the brain. Symptoms may also include irritability, cravings for sweet or starchy foods, and significant weight gains. Weather often affects your mood. Some people, however, are vulnerable to a type of depression that follows a seasonal pattern. For them, the shortening days of late autumn are the beginning of a type of clinical depression that can last until spring. This condition is called "Seasonal Affective Disorder," or SAD. Research into the causes of SAD is ongoing. However, SAD is thought to be related to seasonal variations in light. A "biological internal clock" in the brain regulates our circadian (daily) rhythms and the production of neurotransmitters that regulate sleep, mood, and appetite. For many thousands of years, the cycle of human life revolved around the daily cycle of light and dark. We were alert when the sun was up; we slept when our world was in darkness. The introduction of electricity has relieved us of the need to be active mostly in the daylight hours, but our biological clocks may still be telling our bodies to sleep as the days shorten. This puts us out of step with our daily schedules. The symptoms of SAD generally disappear when spring arrives. For some people, this happens suddenly with a short time of heightened activity. For others, the effects of SAD gradually dissipate. If you feel depressed for long periods during autumn and winter, if your sleep and appetite patterns change dramatically and you find yourself thinking about suicide, you should seek professional help. There is effective treatment for SAD. Even people with severe symptoms can get rapid relief once they begin treatment. People with mild symptoms can benefit from spending more time outdoors during the day and by arranging their environments so that they receive maximum sunlight. Keep curtains open during the day. Move furniture so that you sit near a window. Installing skylights and adding lamps can also help. Exercise relieves stress, builds energy and increases your mental and physical well-being. Build physical activity into your lifestyle before SAD symptoms take hold. Make a habit of taking a daily noon-hour walk. The activity and increased exposure to natural light can raise your spirits. Many people with SAD respond well to exposure to bright, artificial light. "Phototherapy," or light therapy, involves sitting under a special fluorescent light box once or twice a day. A health care professional should be consulted before beginning this kind of treatment. Exposure to bright light stimulates the pineal gland, which suppresses the secretion of melatonin, the sleep hormone commonly overproduced by SAD sufferers. A high fidelity light source of 10,000 LUX, such as the Verilux HappyLite Sunshine Simulator works by providing daylight balanced, soothing, glare-free light in a concentrated "dose." Increasing your exposure to light, monitoring your diet, sleep patterns and exercise levels are important first steps in maintaining your health and regulating your Circadian Rhythms. For those who are severely affected by SAD, devising a treatment plan with a health care professional consisting of light therapy, medication and/or cognitive-behavioral therapy may help to relieve these depressive symptoms. be awake and alert at off-times to carry out experiments or vehicle maneuvers. It appears that every scientific discipline has its own defining moment, an event that is touted later as the moment of "birth" of the field. This can be a publication of a paper (think of Watson and Crick) or a book ("Origin of Species" anyone?). In the case of Chronobiology, it was the 1960 meeting at Cold Spring Harbor. The book of Proceedings from the Meeting (Symposia on Quantitative Biology, Vol.XXV) is a founding document of the field: I have two copies, my advisor has three (all heavily used and annotated). The 1960 meeting was not the first one. There were a few others before, e.g., one in Stockholm, Sweden, another in Feldafing, Germany. But the Cold Spring Harbor meeting was special. Why? I don't know - I wasn't even born yet. I have a hunch that there were several aspects of this symposium that made it different from the preceding meetings. First, the sheer number of participants was larger thus, perhaps, reaching a critical mass, or crossing a treshold needed for the group to feel as if they are not just congregating individuals but a part of something bigger. Additionally, being a part of a venerable tradition of powerful meetings at Cold Spring Harbour may have signalled to the group that they were finally taken seriously by a broader scientific community. Second, it appears that this was the first time all the participants really understood that the diverse phenomena they were studying were unified by more than just appearance of oscillations, but that they were different aspects of just one basic biological phenomenon for which, for the first time, they had a name: circadian rhythms and clocks (as well as other circa- rhythms), the term coined by Franz Halberg in 1959. It is fun to read the Proceedings every now and then and compare the state of science, as well as way of thinking, between 1960 and 2005. One obvious and expected difference is in genetics. Today almost every paper has a picture of a gel. In 1960. Watson and Crick were still busy. The lack of understanding of molecular (the often-used term then was "subcellular") mechanism was a frequent lament in the papers comprising the Proceedings, and was subsituted with an unusual (to our eyes) amount of complex mathematical modelling (and that was before the personal computers!). Another thing that immediatelly catches one's attention is the enormous number of species studied compared to current reliance on about a dozen model organisms (e.g., human, rat, mouse, hamster, chicken pineal in vitro, Xenopus frog, zebrafish, fruitfly, Neurospora bread mold, Arabidopsis plant, Synechococcus cyanobacteria). Particularly, the number of plants and protists is amazing, as the current chronobiology is so animal-centered, mainly due to the need to use models for human disease for the purpose of funding. If you ask researchers today who the pioneers of the field are, the most likely list of "Fathers of Chronobiology" will emerge, including Colin Pittendrigh, Jurgen Aschoff, Gustav Kramer, Erwin Bunning, Karl von Frisch, August Forell, Curt Richter, Frank Brown, Max Renner, Rutger Weaver, Woodie Hastings, Eberhard Gwinner, John Palmer, Franz Halberg, Michael Menaker and Serge Daan, among others (the last three are still active, the rest are retired or dead). If you asked the 1960 participants, including all of the mentioned men, they would have probably trotted out a list that looks like this: Ingeborg Beling, Anthonia Kleinhoonte, Rose Stoppel, Beatrice Sweeney, Patricia DeCoursey, Janet Harker, Miriam Bennett, Dorothea Minis and Ursula von StPaul. Huh? "Mothers of Chronobiology"? What happened? The proportion of the women in chronobiology is today, as it apparently always was, very high, even for biology which is rating the best among natural sciences. I am not going to risk a "Summers" mistake and suggest anything remotely like a genetic explanation (e.g., cyclicity of woman's physiology attracting women to study cycles). Yet today, most of the Big Names are men, while in the past at least half of the Big Names were women. There are many women inhabiting the labs and doing marvelous research today, but rarely as heads of Big Labs. Patricia DeCoursey is still active and, a living legend as she is, she can do whatever she wants. Amita Seghal and Carla Green also come to mind as current big female stars with their own Big Labs. But otherwise it is men, men, men (hey, I am a man and I want to have a Big Lab and become a Big Name, too). Why has the situation changed over the decades? Big Names today are people with Big Labs. Male-dominated culture results in more men heading Big Labs. At the same time, expense of research ensures that much of the work is neccessarily done in Big Labs. It is difficult nowadays to get exciting work funded, done, published and revered if your lab is a little dark room in the basement. Half a century ago, the picture was different. Science did not require exorbitant amounts of money, huge lab space, dozens of technicians and students, and rapid rate of publishing. One could spend years in a dark basement room and finally emerge with such exciting and novel discoveries as to immediatelly become a Big Name. The male-centered culture ensured that best and brightest male students got into the biggest, most popular labs, leaving the female candidates with remnants - working with some semi-crazy professor in the basement who is doing some weird semi-scientific stuff. It is a big risk, but if that crazy professor is onto something revolutionary, the final payback can be huge. Until the 1960s, chronobiology was regarded as weird stuff. Gustav Kramer was partically funded by Duke University Department of Parapsychology! It was as far in the left field as you could get in science. It was the daring loners who did the best of the earliest stuff, not the thousands of mainstream scientists involved in doing regular science of the day in big laboratories. Today, it is difficult being a weird loner. Only mainstream, bandwaggon science gets funded at all. Chronobiology is now as mainstream as can be. There is almost no issue of Science Magazine without at least one paper on the topic. Does it mean that it has lost some of its creativity? It is interesting to see, reading the Proceedings, what did the last 45 years bring to the field. While nothing was known about clock genes and the molecular mechanism, it was strongly anticipated and some fairly plausible models were put forward, not too different from what it turned out to be in the end. As you can see, everything important about clocks has been figured out by 1960 and has stood the test of time since then. If anything, today's crop of students is less sophisticated - some of the papers from 1960 induce a headache, that is how conceptually difficult it is to understand them. Yet they are not bogus or useless. Those are very important papers in the field, resulting from years of very creative experimenting, and should be a part of training of every new chronobiologist. But, they are not taught in courses. They are not read at lab meetings. Much of the lore is now lost. Those who forget history are liable to repeat it. Those who are unaware of the early research in the field can make big mistakes. I have seen a young researcher present his paper at a meeting and he tried to interpret his data with an explanation that was disproven about 50 years ago. Prompted by a person in the audience (who actually did that research 50 years ago), the young guy admitted he had never read or even heard of that series of papers. And this was not some obscure series of papers, this was doctoral research of one of the founding leaders of the field, something that should be everyone's required reading. Reading the old literature (from late 1920s till late 1980s) can be an excerise in frustration. There are creative ideas and plausible hypotheses that nobody has tested yet. There are lines of research that have been abandoned, yet modern techniques should make the continuation easy and fun, but nobody is doing it. There are species that promise to be great models for modern research, but nobody is looking at them any more. Finally, there is a long list of papers with data that directly contradict the current understanding of the way the circadian clock works. Nobody is revisiting those data to repeat the experiments or explain them in light of current knowledge. When one reads those papers, one starts to doubt if the current model is correct. The recent data are compatible with the present consensus model, but some of the old data are not. If all you know is the current model and the current data, and that is the only way you think about it, you will never realize that there may be alternative models that are compatible with ALL data, both recent and old. The recent research assumes that the model is correct and tries to work out the fine details. Knowledge of the old data should force people to directly test if the model is correct or not. But who is going to get funded to repeat a 1928 experiment? I plan to devote a whole future post to the whole gammut of data contradiciting the current molecular model. But I first have to make my way to describing the model itself, and that will take several posts over the next few weeks. The Tangled Bank #20 is now online. Go enjoy the best of science writing of the blogosphere. BIOMEDICINE: A Good Night's Sleep? One of the distressing symptoms of progressive neurodegenerative disorders such as Alzheimer's, Parkinson's, and Huntington's diseases is the severe disruption of sleep patterns, which leads to anxiety and distress in both patients and their caregivers. Two recent papers now shed light on the cellular and molecular mechanisms of sleep disruption in Huntington's disease (HD). produce the neuropeptide orexin, loss of which has been implicated in narcolepsy. Decreasing amounts of orexin in the cerebrospinal fluid of HD patients could thus be used as a marker of HD progression. hopefully will contribute to better management of these distressing symptoms. Hum. Mol. Genet. 14, 39 (2005); J. Neurosci. 25, 157 (2005). the pupil of the eye. "It’s a general brightness detection system in the eye,"
confirming that melanopsin is the photopigment for ganglion-cell photoreceptors. "This resolves a key question about the function of these cells," Berson said. well tell us that this is an extremely ancient system in terms of evolution,"
Ha, strike one for melanopsin! This is one of the ongoing big battles in chronobiology. On one side is the Melanopsin "mafia", led by Foster, Provencio and Berson. Their strategy is to show that melanopsin is the only photopigment involved in circadian photoentrainment and completely ignore the existence of other pigments. On the other hand, there is the opposing Cryptochrome "mafia" (Sankar, Ruby, van Gelder) whose tactic is not just to show that cryptochrome is the pigment, but also that melanopsin is not. Both sides have some very strong and some very fishy data to show. Of course, there is the third group, the sophisticates led by Mrosovsky who realize that a complex, and somewhat redundant system is what should be expected from evolutionary theory in the first place. They, just to make a point, produce great data demonstrating that yes, classical rods and cones (wit htheir pigments rhodopsin and color-opsins) also play a role in entrainment. With each pigment tuned to a different wavelength of light, and the spectral composition of natural light changing over the course of the day, isn't it reasonable to expect that a finely tuned photodetection system would be able to track such changes in the environment? Anyway, what is exciting about this study is the ancient origin of the signaling cascade, something that has been semi-expected by the field, as circadain photoreception is an older function for photoreception than vision. The next big question: are deep-brain extraretinal photoreceptors in birds, reptiles, amphibians and fish also ancient? How about their pineal and parapineal (frontal organ) photoreceptors? What photopigments and transduction signalling cascades are involved? avenues for treating blind people. cells use related pigments to discriminate colour. with the neurons at the base of the brain that set the daily body cycle. of their work appear this week in the journals Science1 and Nature2,3. functions as a photopigment," says Hankins. proteins still work in the cells of different species. understand the evolution of the circadian rhythm system in humans, says Panda. a vision researcher at City University in London. because there are some forms of blindness where the rods and cones are lost,"
melanopsin could help them to form images. S. et al. Science 307, 600-604 doi:10.1126/science.1105121 (2005). information to their target cells, as most other neurons do. larvae only have one structure for gathering visual cues, called Bolwig's Organ. information to the pacemaker neurons to reset their molecular clocks. evenly between the light and dark halves of the Petri dish. larvae are most sensitive to light at dawn and least sensitive toward dusk. intensity of the transmitted signal depending on the time of day. as sleep disorders and jet lag. Hmmmm, this is one messily written press release. I have not seen the paper yet, but from what I can glean from the release, the pacemakers control a circadian rhythm in photosensitivity. When the pacemaker is deleted, the rhythm is abolished. This may or may not be sufficient to explain the data, i.e., the larvae are not blind, but just do not "care" any more about light intensity. I will update once I read the actual paper. whereas deeper, non-REM slumber encourages gentler, kinder dreaming. rehash of random images, according to the researchers. Flickr Photos of sleeping people (and animals) - cute! So, are you ready to do chronobiological research? If so, here are some of the tips - the thought process that goes into starting one's research in chronobiology. First, you need to pick a question. Are you interested in doing science out of sheer curiosity to discover stuff that nobody knew before (a very noble, but hard-to-fund pursuit)? Or would you prefer your work to be applicable to human medicine or health policy, veterinary medicine, conservation biology, or agriculture? Do you want to figure out some nitty-gritty details about the molecular basis of circadian rhythms, or neural connections between pacemakers in a mammalian brain? Perhaps you want to know if a cave animal still has a functioning clock, or if a microorganism has a clock at all. Or perhaps, you are interested in tests of adaptive function of biological rhythms and want to do your research out in the field. You may be looking for an organism to evaluate if it can become a new model, or you already know which of the current model organisms you are going to use. Are you a kind of person who revels in a competitive area, rushing to publish as many papers as quickly as possible, each paper certain to add just a little bit to the current knowledge, all the papers accumulating reputation for you in the long run? Or are you a kind of person who prefers to tackle a difficult and risky project with no guarantee of success but a high return if it does succeed in the end, a project that may take years to accomplish while you live in obscurity, but can potentially result in a minor revolution in the thinking within the field once it is done? Think hard about the kind of personality you are and how thick is your skin. No matter what your project is going to be, if you are in chronobiology, you have to be able to continuously monitor biological rhythms in your organisms for at least several cycles. Rare are the experiments in which you can make do without it. For instance, if you are looking at circadian rhythms of gene expression, you still need to know the phase of the cycle at which you are taking your samples. You can only know the phase if you are monitoring some kind of output of the circadian system. The most widely used overt rhythms in laboratory research are behavioral rhythms, e.g., gross locomotor activity, wheel-running activity in rodents (and cockroaches), perch-hopping rhythms in passerine birds (songbirds), tube-running behavior in fruitflies, feeding or drinking rhythms in some other animals, etc. The advantages of behavioral rhythms are the ease and low cost of monitoring them (a LED diode, or a simple switch will do the trick). The disadvantages are the sensitivity of behaviors to various environmental events. For instance light (or darkness) may directly stimulate (or inhibit) behavior regardless of the phase of the clock. Mice are much more light-shy than rats, for instance, though both are nocturnal rodents. Darkness may inhibit feeding in some diurnal animals. The ability of an environmental cue to directly induce changes in the measured output is called masking, and one needs to be aware of this in one's model animal, either from published literature, or by running a set of experiments to determine the appearance and/or intensity of masking. If masking effects make the project impossible, one should lookk at other possible outputs, e.g., body temperature, heart-rate, blood-pressure, oxygen-consumption, blood levels of a hormone (e.g., melatonin). The best thing to do, if technically feasible, is to simultaneously monitor two or more overt rhythms in each animal. Here is an example of a laboratory setup for studying circadian rhythms in rodents. A hamster, in this case, is housed in a cage that contains a running wheel. The running wheel has a switch that registers every revolution of the wheel and sends that information to a computer. The computer puts a time stamp on each data point, and collects the data over long periods of time. For visual analysis of the data, computer software was developed that presents the data in a graphical format called an actograph. As you can see in the figure above, an actograph has 24 hours of the day plotted on the X axis. The data from the first day are plotted on the top, the second day is plotted immediatelly below the first day, the third day data below the second, etc. Each time point (e.g., in 10-minute bins) is depicted either as white or black. White denotes times when wheel was not moving. Black denotes times when the hamster was running in the wheel. Once the whole actograph is printed out, one can see long-term patterns. 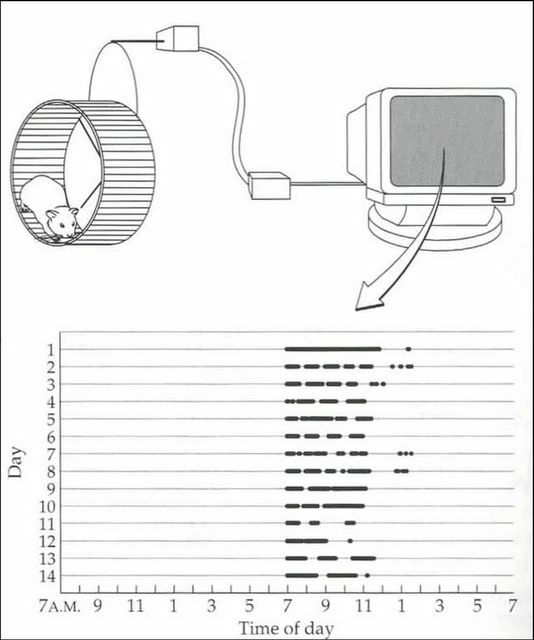 In this example, the hamster was kept in a light-dark cycle (LD) with 12 hours of light (from 7am till 7pm) and 12 hours of darkness (LD 12:12). From the actograph, we can see that the circadian clock driving wheel-running in this hamster has entrained (synchronized) to the LD cycle - the hamster was running in the wheel at the beginning of each night. However, at his point, we are still not certain that what we see is the real output of the circadian clock, as the same pattern would emerge if light exerted a masking effect on behavior by inhibiting wheel-running. Thus, at this point in our research project, the rhythm is properly called a diurnal rhythm, not a circadian rhythm (the insect folks like to call this diel rhythm). How do we know if the observed rhythm is really circadian? By releasing the animal into constant conditions, usually constant darkness (DD). In some animals, DD inhibits feeding, thus we have to use very dim constant light (dLL), often of a single wavelength (e.g., green). In photosynthetizing organisms, like plants, we usually use constant light (LL). Here is an example of a diurnal animal (a gallinaceous bird) kept initially in LD cycles, then released into DD. The measured overt rhythm here is core body temperature (measured by radiotransmitters implanted into its abdominal cavity, with a receiver and a computer translating transmitted radiofrequqncy into degrees Celsius). White represents body temperature below the mean temperature of that particular day, while black represents times (in 10-minute bins) when the temprature was above the daily mean. Notice how the temperature rhythm entrains to the LD cycle but, after release into DD (after about two weeks), continues to cycle indefinitely. This is called a freerunning rhythm. The morning rise of body temperature occurs a little bit earlier every day, thus the inherent, endogenous, genetically determined period of the freerunning rhythm of this bird is shorter than 24 hours. Actually, in this example, it is about 22.5 hours. Another way to plot data is a strip chart. This method allows one to plot only a rather small number of days/cycles, but has an advantage of showing the amplitude and the exact shape of the rhythm. For instance, this is a strip chart of human body temperature over just a single cycle. Actually it is more than a simple strip chart, as it is a composite of four groups of humans. Each data point is an average of measurements taken at that particular time point from the whole group. Further, each group has been held at a different ambient temperature. Comparison of the four strip charts all plotted together tells us the amount of masking that environmetal temperature can exert on the clock-controlled rhythm of core body temperature. the spring and summer.n Carbohydrate cravings. Anil Ambani, knows, catching a nap is quite different from being caught napping. separates the benefits of sleep from an over-doze. expected to be one of this year’s most heavily marketed medications. shut-eye and not just for a while, but indefinitely. that part of growing up. the fish, research that may someday help insomniacs get a good night’s rest. them into a sleep-like stupor and affects the timing of the sleep-wake cycle. other BU researchers build their own facilities. Zhdanova says its popularity "in the United States and abroad is exploding." The video-monitoring system was invented by Dr.Greg Cahill (at U. of Texas at Houston, I believe). The tiny fish larvae are placed in a 96-well plate and a camera is positioned above. A special piece of software was developed to analyze daily rhythms of activity (random swimming around the well) for each individual fish. Behavioral output such as gross motor activity has its pros and cons, but works perfectly well for the kind of research that Dr.Zhdanova is doing. physiology, and studied psychiatric diseases such as manic depression in St.
became interested in the complicated biochemistry involved in regulating sleep. they would wake up. Since then, I’ve loved zebrafish." The same property of permeability of the zebrafish skin to melatonin was used by another researcher, Dr.Keith Barrett (then at The Howard Hughes Center for Biological Timing at Northwestern University in Chicago, IL), to develop a method for monitoring physiological circadian rhythms in zebrafish. He also placed fish larvae in a 96-well plate, but has modified the plate somewhat, allowing the water/medium to flow through each well at a steady rate (via tiny input and output tubes). The medium coming out of each well was collected by a fraction collector and each hour the test tubes were automatically moved and the medium would start flowing into the next set of test tubes. This way, each tube contained the medium collected from a single well (fish) over a period of one hour. As the zebrafish produce melatonin, and the melatonin permeates the skin, it naturally leaks out into the medium. Thus, Keith only had to assay the samples for melatonin concentrations in order to monitor daily rhythms of melatonin synthesis and release in zebrafish. While a great system, overcoming the problems of a gross behavioral output, it is unsuited for Dr.Zhdanova's work as she is supplementing melatonin into the medium in the first place. 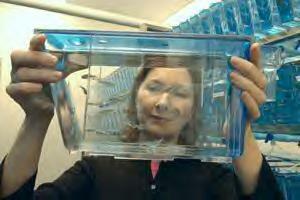 pans out in zebrafish, Zhdanova can then test it in monkeys. physiological function is still an enigma." "
re-read the whole home library for several times. pathology," said Fyodor Koshel, chief of the Lutsk city health department. "Nesterchuk does not look exhausted because of insomnia." Whenever these people are brought into the lab, hooked up to EEG and monitored overnight, they are always found to sleep just fine, thank you, except that they do not remember having slept afterwards. A new literature review reveals mixed results for patient safety when work hours are cut. manner that still provides excellent patient care." intern to make the new schedule work. review shows that you don't always reduce errors by just reducing hours." How about paying attention to the residents' circadian rhythms? read it as meaning the meeting has been moved to Friday. the truth of certain statements about temporal relations (e.g., April comes after March). This implies that our time concepts are heavily influenced by the way our languages relate time and space conceptually. order, and in no particular order. stories of the same length that were less interesting. shift in our circadian rhythm, or our biological internal clock. also reported falling asleep while driving or while stopped in traffic. just getting enough sleep; when we sleep is also an important factor. Most sleep-related accidents occur between 2 and 6 a.m., those hours when humans are biologically programmed to sleep. frequent mood cycles may require rapid alterations in their therapeutic regimen. interventions can be helpful to these often treatment-resistant patients. One thing they do not mention is that Lithium is one of the most effective drugs in the treatment of bipolar disorder. Lithium is also one of the very rare substances that is capable of altering properties of circadian rhythms (lengthening the period). If I remember correctly, a couple of years ago Eric Herzog and colleagues published a paper demonstrating that Lithium lengthens the period of the circadian rhythms of individual dispersed cells of the suprachisamatic nucleus in a dish. The work until then was all on effects of Lithium on rhythmicity of whole animals, thus various feedback loops between the clock and other brain areas could not be discounted. Pushing Sleeping Pills - Beware! ...an interesting article(http://www.motherjones.com/news/outfront/2005/01/12_402.html) on the marketing of sleeping pills for the weary and whether it's going to be an example of overblown pharmaceutical company advertising in the near future. The main problem, as I see it, is that the benefits of these drugs are surprisingly modest and will no doubt be exaggerated in the marketing campaigns. Also, two out of the three new drugs are related to Ambien (http://www.ambien.com/), which has some problems of its own, mainly if the patient takes it too soon before wanting to go to sleep, as it can cause confusion and amnesia(http://sleepdisorders.about.com/od/medication/a/ambieneffects.htm) if you take it and stay awake. Each generation of sleeping pills is relatively homogenous and faces common clinical and regulatory barriers. So, the makers of zolpidem, zopiclone, and zaleplon face similar challenges even though their competing fiercely with each other for market share. The following set of quasi-incommensurable messages provides a veritable smorgasbord of rationales for prescribing the maximum number of sleeping pills to the broadest segment of the population for the longest period of time. In a couple of weeks, once the site looks the way I want it to, I will send an e-mail to every chronobiologist in the world, asking them to come and check it out, post comments, send me suggestions, perhaps do some guest-blogging. Hopefully, some of them will use it as an educational tool when they teach courses about biological clocks. Which leads me to a warning to students. If you copy even a smallest snippet of content from this blog and paste it into your term paper, you are very likely to get in trouble for plagiarism. This blog shows up in every search engine I could think of checking (from Google, Yahoo and MSN, to specialized blog-searches like Technorati etc.). Almost all colleges, and many high schools, now have special software for detection of plagiarism. Even the oldest and seemingly out-of-touch instructors use the Web to keep up with news, search for images to include in their lectures, etc. If they teach about clocks, either whole specialized courses in chronobiology, or just single lectures within broader courses in Biology, Physiology or Behavior, they are highly likely to find themselves reading this site. So, beware. Use this blog as a source of information, not as a source of whole sentences. OK? OK!? ...now go and read the whole thing, including the details of studies that tested the biorhytm "hypothesis". Try to understand the logic behind the biorhythms and why that kind of logic makes it (and similar ideas) pseudoscientific. Then follow the links and references for more good stuff. And, by the way, the term "biochronometry" used in the passage above was an early suggestion (by Mike Menaker) for the name of the discipline which is now established under the name of "chronobiology" - the topic of this blog. Belief in biorhythms is one of the "benign" superstitions. Its believers are not very numerous. They do not, generally, try to "evangelize" their belief and their belief usually does not harm anyone else. A couple of shady businesses peddle "biorhythm calculators" but those are cheap and one needs to purchase only one in a lifetime, so this is not one of those foibles that can easily lead to personal financial devastation. Thus, this is not something that magazines like "Skeptic" and "Skeptical Inquierer" urgently feel needs constant hammering in every issue. 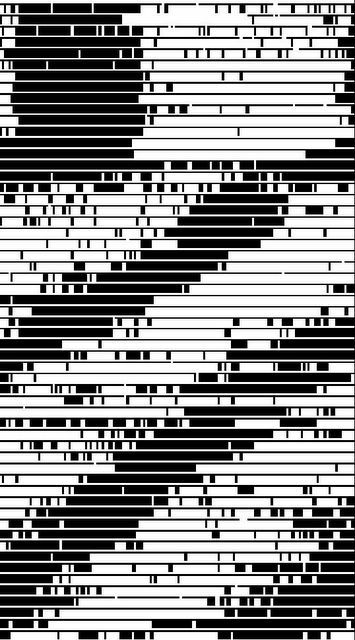 Martin Gardner wrote a beautiful chapter in one of his books telling the whole strange history of biorhythms, including the possible Platonic amorous relationship (followed by a falling out) between Wilhelm Fliess and Sigmund Freud, the fight over primacy with Herman Swoboda, the mystery of stolen files during the WWI, the subsequent addition of the third cycle by Teltcher, and, again, mysterious loss of files during the WWII. John Palmer wrote an excellent article debunking the whole construct from a scientific point of view (I'll try to find my copy somewhere in this mess so I can add the reference later). As stated in the beginning of the article linked above, this "theory" is testable and has been tested a number of times, thus proven to be wrong. So why do some people still believe it? Imagine taking a sample of 100 biorhythm believers and giving them a questionnaire or an interview. How many of them are aware that this was tested and proven wrong? One? More likely none? These are not the kind of people who would gravitate towards reading "Skeptic". They do not know the whole thing is bogus. Of course they do not know or use Sagan's Baloney Detection Kit. Of course, their understanding of science is that it is a boring subject they were forced to take in high school and somehow managed to get a D. They are likely to be really nice, sweet people, and probably quite innately smart. So why didn't they figure it out by themselves? Because it never occured to them to ask the question "Is this true or not?" When they first heard of it, they thought it was fun, they started charting their biorhythms and never once stopped to think about what they were doing. The influences of biorhythms are supposed to be "subtle" so no matter what kind of day you really had you can shoehorn it into agreement with your biorhythm state for that day...kinda like a horoscope, you can always imagine a "good fit". When you are a kid, you believe everything you see, hear or read. When I was a kid I read all the books by Erich von Daniken and believed every word in them. But I grew out of it. Most people do not. They keep believing stuff just because a person who looks like a person with authority said so. Additionally, most people are too focused on their everyday lives, their relationships, job, and leisure, to ever stop and think about big questions or to question their deeply held beliefs. They just live from one day to another in sweet oblivion about life's persistent questions. Can't blame them, really. Except when they use their under-exercised brains to make decisions that affect all of us, like participation in elections. It is easy to swallow Frank Luntz's linguistic constructs if one never doubted anything in one's life. I guess the Social Security must be in crisis - after all, no less an authority than the President himself said so. Biorhythms are quite benign, they tend not to invoke a terribly emotional response in believers, they are testable and tested negative, so perhaps they may be an ideal test-case for teaching the schoolkids about skepticism, about the difference between science, pseudoscience and nonsense, about historically silly ways some of these hoaxes originated, and about proper application of the Baloney Detection Kit. I don't see any powerful lobby fighting against the inclusion of such a lesson into the curriculum, yet this may provide the spark that triggers a lifelong habit of critical thinking in a substantial proportion of the population - an experiment that may be worth doing for the sake of the country.